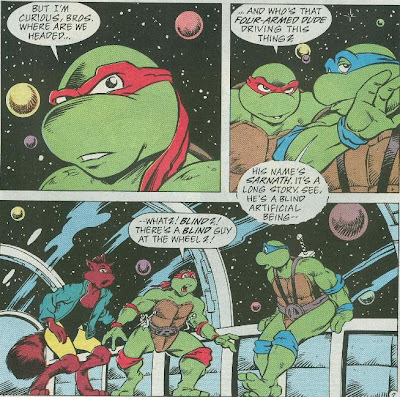 On Sarnath’s ship heading toward Dimension X, Leo details their battle with (and befriending of) Sarnath and the Turtles' subsequent reveal over national television to Raph and Ninjara. Something more interesting awaits them, however: a black hole. Don explains that black holes are stars that have collapsed in on themselves, curving space around them and becoming so gravitationally powerful that not even light can escape their pull. Suddenly, they are attacked by the Imperial Aerwyl Fleet, who have mistaken Sarnath’s ship as belonging to some group called the “Nova Squadron”. The Aerwyl begin landing direct hits on Sarnath’s ship, inciting the Turtles and Ninjara to don pressure suits for safety. Sarnath guns down one of the Imperials as another flies out of control into the mouth of the black hole. The last ship, unfortunately, lands a critical hit, ejecting the Turtles and Ninjara into an asteroid field. Sarnath sends Qark away in an escape pod, asking the Turtles to look after his pet, as he drifts helplessly into the black hole. The Turtles attempt to fight back against the remaining Imperial ship with their handheld laser blasters, but they haven’t the firepower to do any damage. Luckily, Nova Posse shows up in the nick of time, destroying the last Imperial ship and rescuing the Turtles, Ninjara and Qark. Inside, Nova Posse introduces themselves as Zebulon, Trip, Rave, Grotto, Exeen and their commander, Luna Azul. Apparently, they were formerly of the Imperial Aerwyl Starfleet, known as the Nova Squadron, but struck out on their own (hence the animosity from their former employers). They explain that the black hole they just encountered wasn’t there six months ago, and neither was a star; it simply appeared out of nowhere. As Nova Posse approaches Stump Asteroid (where Cudley the Cowlick stands vigil with a fleet of ships), Trap gives them clearance to land. Stump and Sling come rushing out, but not to greet Nova Posse; they want to know when the Turtles plan to wrestle again. Raph cuts the crap and asks what Nova Posse is doing on Stump Asteroid. Stump explains that they’ve come to help defend them against the Imperial forces. While the expositioning is going on, Don leaves to try and find a bathroom. As he inspects the many strange toilets, a bright light and grey hands appear before him. Later, when Leo comes to check up on him, Don is missing, leaving behind only an empty pressure suit. At a secret headquarters in an undisclosed location, four gun-toting weirdos open fire on a poster of the Mighty Mutanimals. They are the cyborg, Waster, the motorcycle-legged eyeball-headed freak, Dead-Eye, the skull-clad Lynch and their apparent leader, the grey-haired Fist. Fist tells his men that it’s finally time to go after the real thing; it’s finally time to kill the Mutanimals. *This story is continued from TMNT Adventures #47. The story continues in TMNT Adventures #49. *The Turtles last visited Stump Asteroid and it’s wrestlers in TMNT Adventures #37. Cudley the Cowlick was called from Earth to deal with a threat at the asteroid in TMNT Adventures #38. 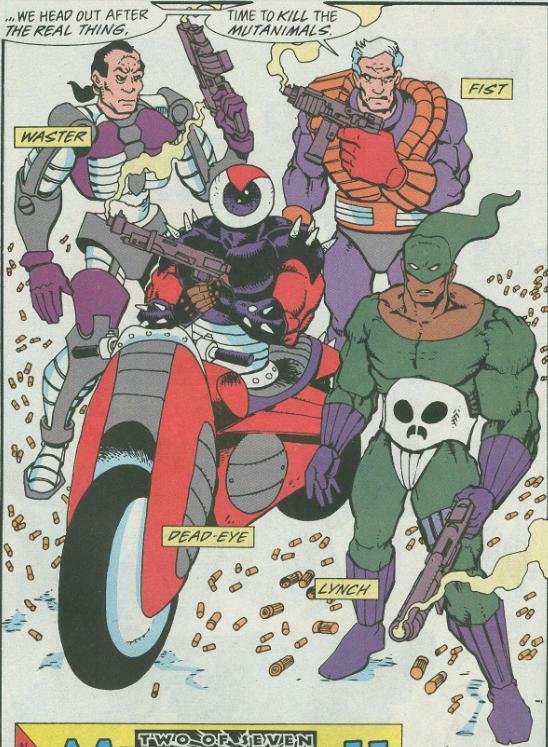 *The Sons of Silence last appeared in TMNT Adventures #13. *The Mighty Mutanimals last appeared in Mighty Mutanimals #9. *Three members of the Gang of Four were originally created as villains for the unproduced Mighty Mutanimals cartoon before being introduced in TMNT Adventures. They had different names for the cartoon, too. Waster was called “Executor”, Lynch was called “Gunskull” (and was white, too) and Dead-Eye was called "Guzzler". *This issue also included a Gary's Gag Page short, "What the Shredder did for a Living Before he Became an Arch-Villain". *This issue was NOT published in the UK by Fleetway. The “Black Hole Trilogy” begins. While I generally don’t care for the sci-fi space epic side of the Turtles, I can endure it in limited doses. The outer space arc in Mirage’s TMNT and its subsequent adaptation for the 4Kids series suffered because it dragged on for way, way too long. The “Black Hole Trilogy”, thankfully, is nicely compacted into three installments that breeze by thanks to the fast pacing of the story. In that regard, it’s one of the more enjoyable space-Turtle stories, as it doesn’t overstay its welcome. This opener for the story arc kind of hits the audience hard with exposition and set-up, as we encounter a lot of characters very quickly and have to hear their histories and motivations lickety-split. To Steve Murphy’s (Dean Clarrain’s) credit, he pulls it off rather well and the info-dumping is skillfully scattered about the issue so it doesn’t strike you all at once. Don’s stopping to explain the physics of a black hole to the audience was a nice way of filling the book’s educational requirement, and to my surprise, Don doesn’t dumb down any of the vocabulary, so it comes off as a perfectly in-character string of brainiac-babble, disguising the fact that it’s trying to teach kids something. I was pleased with the even ratio of male-to-female members of Nova Posse. Usually, artists or writers will pull a “Star Trek” and make an all-male team with a single token female, so it was refreshing to see Murphy and Allan avoid that trend. In fact, the female members are the only ones that get to say anything useful! Again, Murphy is really capitalizing on the solid universe-building he’s been doing since he started on the book. Not only do we have the mythos behind Sarnath initiating the story arc, but we’re reencountering Dimension X-ers Stump, Sling and their Intergalactic Wrestlers as well as the Sons of Silence, who haven’t been seen in several years. While new elements are being introduced, it’s all added to a strong foundation that’s been years in the making. 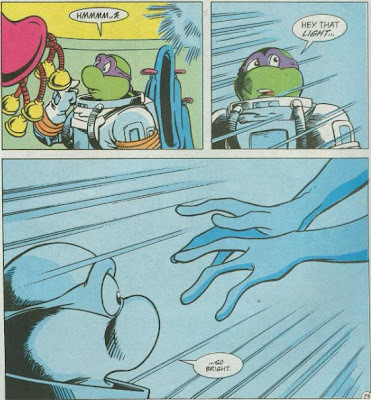 While the space stuff isn’t my thing, I have to give credit where credit is due; TMNT Adventures has one of the most solid and consistent universes of any TMNT fiction. The “Megadeath” arc gets underway, too, but in 4-page chunks it’s going to take awhile. 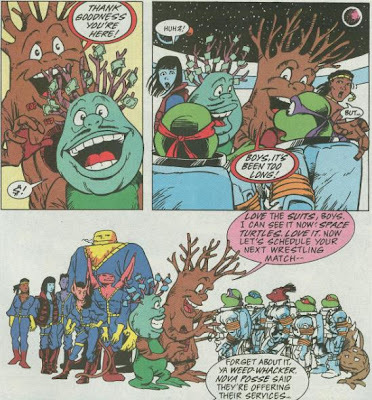 At least three members of the Gang of Four introduced into this issue were created for use in the unproduced Mighty Mutanimals cartoon show. When the cartoon got scrapped, they received new names and a few changes before being worked into the TMNT Adventures comic. Not much else to say yet, other than I question the taste in naming a hooded, gun-toting black guy “Lynch”. Ahh so awesome! The whole black-hole science lesson really taught me something as a kid. Awesome stuff! If I recall from the comic, the panel that inspired the cover has all the turtles' bandana mixed up... or maybe it's the cover that got the bandanas mixed up. 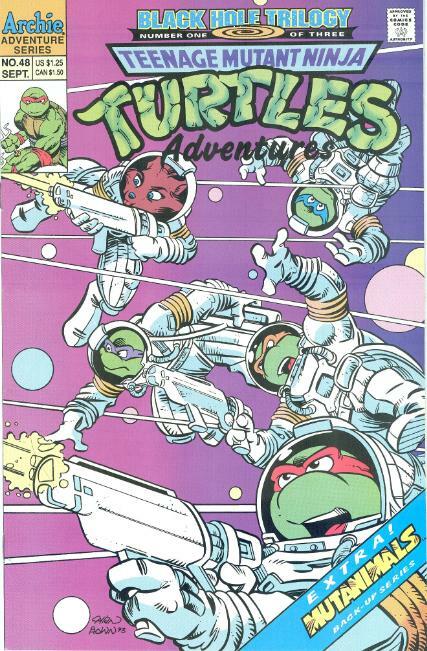 Anyway, it's hilarious that Leo is the one turtle who looks totally incompetent floating around in that suit. the megadeath story... i know i'm getting ahead to the reviews, but i've never liked how this story developed. not because they (the writers) killed the mutanimals, but because they (again the writers) killed them (the mutanimals) with such horrendous, cliché and poorly written villains. we've got to know and like (some of them at least) this characters and then, out of the blew... blam! and such a boring and creative-less death too. they (the mutanimals) deserved much more, they should've died with honor. but i guess it was easier with guns. as leo would say (many many many many times) "i hate guns"... when they are poorly use in a poorly written story. when the time is due, i want to hear your opinion. keep 'em coming! Heh. I had the same reaction to Lynch. Of course, it's a poorly chosen name all around. If Lynch were one of the white guys...well, it'd really make for an uncomfortable office environment with the black guy on the team. Also, Dead-Eye has a motorcycle for legs. That has got to make stairs impossible and getting into buildings incredibly difficult. Showering, too.